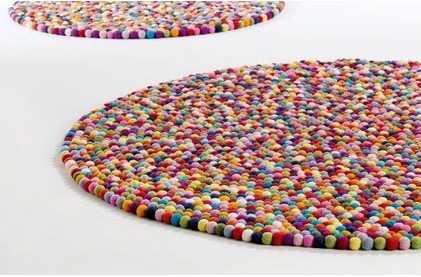 This bold and bright Felt Pop Pom Rug plays with an unlimited colour palette to bring colour-joy to your space. This vibrant rug will bring fun to the playroom or be the statement piece in your living space. Constructed from colourful felt balls fused together, function meets fashion with the soft fabric making for a comfortable and homely piece whilst stylishly livening your home décor.